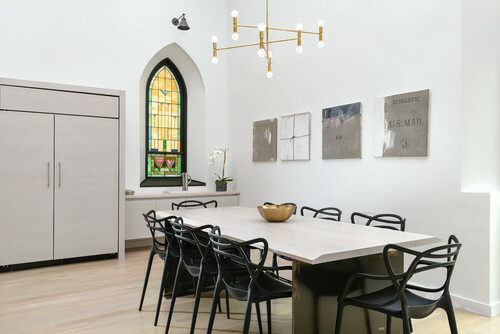 Located in Chicago’s Little Italy neighborhood, this former Methodist church, built in 1901, was a dream project for a young couple who wanted an open, light-soaked home in which to raise their three children. Combining the best of contemporary design while preserving much of the historical character and architecture of the original church was the focus of designer Linc Thelen’s master plan. Finding a happy balance between rustic and modern was at the heart of the conversion process. The church’s ceiling was removed, exposing original wood beams and metal supports; the peak of the ceiling now reaches 25 feet high. The dark wood beams and black metal supports create a stark contrast against the crisp white painted walls. “Removing the old ceiling completely changed the entire feel. The volume is dramatic and allowed for us to make bold choices,” Thelen says. 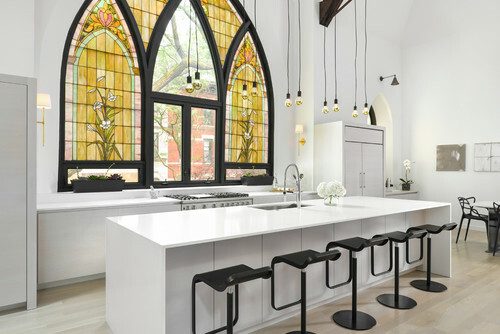 The kitchen’s gas range is centered directly underneath an original stained glass arched window. The window’s frame is painted black. A large central island with room for five counter-height stools is wrapped in white quartz. A custom light fixture designed by Thelen features 10 gold-dipped exposed lightbulbs hanging from 16-foot cords. The custom kitchen cabinets are made from horizontal-grain hickory that has been stained gray. “The amber hues of the stained glass influenced the type of metal accents we chose. The lightbulbs, the sconces and the chandelier above the dining table are all in complementary gold or brass tones,” Thelen says. The dining table is a custom creation designed by Thelen; it features a white oak beveled top stained gray and a steel base. Thelen also made the art on the wall, using vintage U.S. Postal Service mailbags. 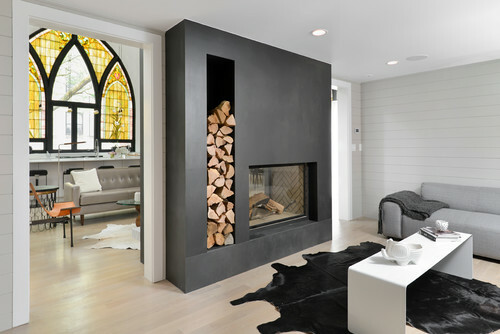 The dramatic floor-to-ceiling wood-burning fireplace is two-sided and made from raw steel. Four nooks were created for firewood storage. Midcentury classic and contemporary furniture pieces comprise the living area. “There’s very few opportunities to design a fireplace of this scale, so there was really no incentive to hold back,” Thelen says. A photo taken from the second-floor balcony provides a great view of the main living area’s layout. 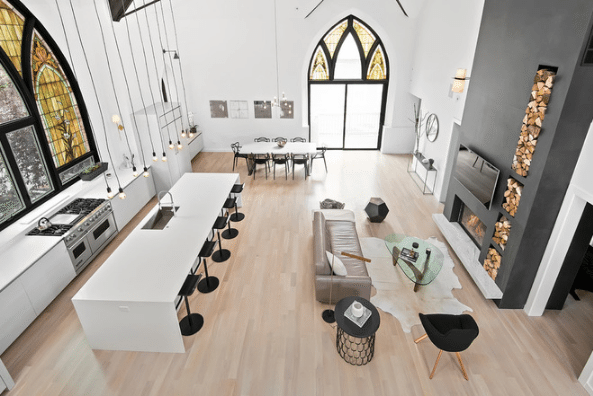 A sliding door below an arched stained glass window leads to a backyard balcony. The entire first floor is covered in white oak. The other side of the raw-steel-encased, wood-burning fireplace inhabits the home’s media room. Thelan selected horizontal shiplap wood for the walls to make the space with its 8-foot-high ceiling feel larger. 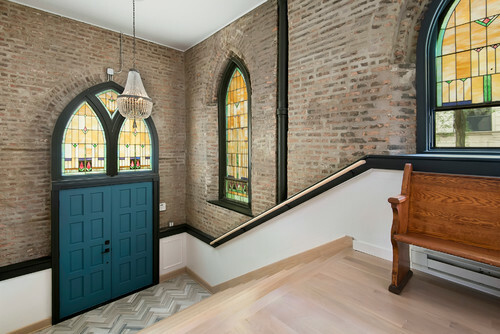 The home’s entryway foyer features exposed brick walls, white oak and herringbone-pattern marble floors, and a pew that’s original to the 1901 church. 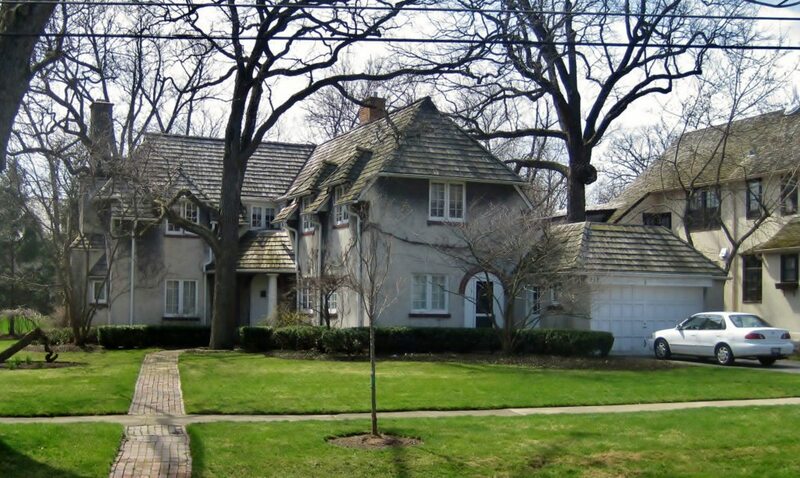 “The blue front door is one of the few things we didn’t change. It’s a shade that’s both traditional and modern, which helps set the tone from the moment you walk in,” Thelen says. The home’s master bedroom has a two-tiered ceiling that creates a natural overhang for the bed. An armchair near the stained glass window is a well-lit spot for catching up on reading. 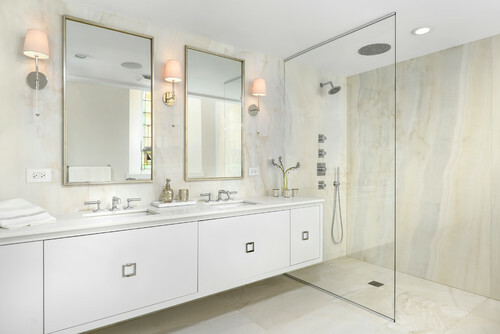 Large slabs of brightly polished white onyx cover the floor and walls of the master bathroom. The custom vanity has painted white lacquer cabinets and stainless steel buckle-inspired hardware. 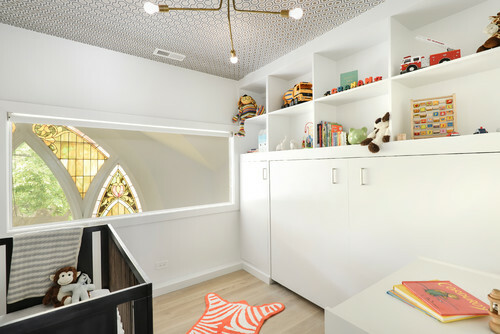 A child’s bedroom includes a floor-to-ceiling climbing wall made from cement plaster painted gray to mimic the look of rocks. A sliding barn door opens to an en suite bathroom. The nursery includes a large cutout window (with glass) that overlooks the home’s main living area. 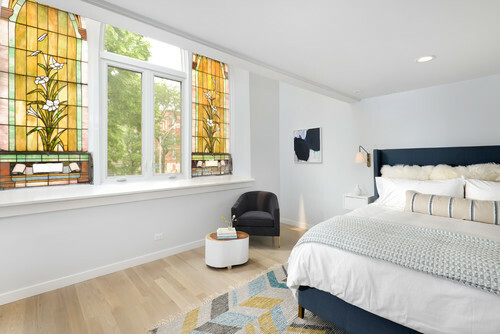 The built-in bookcase conceals a Murphy bed, which will allow the space to be converted into a guest room in the future. 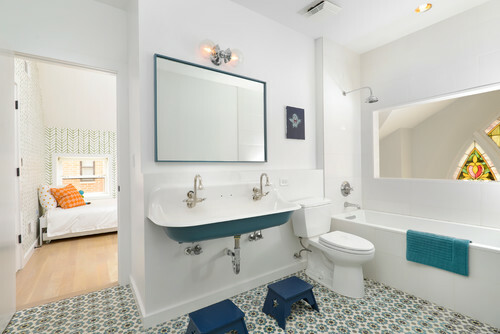 The his-and-her bathroom has a trough sink with two faucets and a colorful Moorish-inspired cement tile floor. The shower has a large cutout window that brings in extra light.